Installed to the WMG40 dual shaft wobblestick, this adapter allows the direct mounting of the original orthogonal pincer grip manufactured by Omicron. Installed to the WMG40 dual shaft wobblestick, this adapter allows the direct mounting of the original orthogonal pincer grips GA02-1810/GA02-1119 manufactured by Omicron. Installed on the WMG40 dual shaft wobblestick, this adapter allows the direct mounting of the original straight pincer grip manufactured by Omicron. Simple part to change the thread size at the end of the shaft (OD=5mm) of a wobblestick manipulator. Adapter for electrical insulation of WM40 wobblesticks. Cylindrical end piece OD=7mm, L=16mm. For WM40 with D=7mm shaft. UHV Preparation system for Elmitec Photoelectron Emission Microscope delivered to Helmholtz Zentrum Berlin (BESSY) in 2007 and installed to SPEEM, Beamline UE49. One heat lamp with ceramic fitting, mounting bracket, and 5m silicone cable. Ion pump high voltage cable, 3m length, for NexTorr™ combination pumps. A double walled, vacuum isolated dewar with DN40CF flange and a DN16CF side port for an electrical feedthrouh. The cold plate is equipped with six tapped holes M3 for mounting in vacuum equipment. LN2 cold trap for fast pump down dock. A double walled, vacuum isolated dewar filled with liquid nitrogen is used to cool a heat exchanger with a large surface area. Dicronite ™ coated ball bearings are an ideal solution for UHV applications. They are ultrasonically cleaned and coated with Tungsten-Disulfide. The Dicronite ™ coated ball bearings are an ideal solution for UHV applications. They are ultrasonically cleaned and coated with Tungsten-Disulfide. Manual Linear Drive with Handwheel for RM and GMD Sample Transporters. 1-axis motorized precision drive unit for RM and GMD sample transporters for automatic and reproducible extension of the shaft. Rotary motion is done manually. 2-axis motorized precision drive unit for RM and GMD sample transporters for automatic and reproducible extension and rotation of the shaft. 2-axis motorized precision drive unit for RMDG or RMJG sample transporters. For automatic and reproducible extension and independent rotation of it's two shafts. The Dicronite ™ coated ball bearings with ceramic balls are an ideal solution for UHV applications. They are ultrasonically cleaned and coated with Tungsten-Disulfide. 4, 6 or 10 pins, 10A per pin, pin diameter 1.42mm or 1.57mm, air side connector included. MPF Products Inc. has a vast inventory of standard products including D-Subs, Sapphire and Fused Silica Viewports, Multipin Feedthroughs, Coaxial Feedthroughs, Thermocouple Feedthroughs and Breaks. Large size vacuum exsiccator (desiccator) cabinet with 2 slots to store larger items under vacuum or in a controlled atmosphere. Dimensions (W x H x D)= 683 x 322 x 337mm. The Tungsten crucible for the EV40-FC evaporator is ideal for the evaporation of metals like Ni, Co, Fe, Au, Ag and Cu. A device for magnetically driven dual shaft sample transporters to elevate and handle wafers. Gas handling system for three Can Gas Bottles. Includes Swagelok high quality stainless steel bellows sealed dosing valves, pumping line and gas feed line, neatly mounted to a panel. This key can be used in combination with WM40/WMWA40 wobblesticks for tightening/loosening in-vacuum hexagonal socket screws. Available in both, metric and imperial type hex keys. Please specify key type and size upon ordering. Turns you wobblestick into an allen wrench. Used in combination with WM40/WMWA40 wobblesticks for tightening/loosening in-vacuum hexagonal head screws. Available in both, metric and imperial sizes. Please specify nut type and size upon ordering. HSASM40-TIPEBFE2-MD16(TS)-ESFC is a tip preparation stage for STM-tips. The stage has a filament for tip annealing and a spherical electrode for a quality check of the annealed tips. The measured field emission current and voltage indicates the quality of the tip. A 50W pyrolitic boron nitride heater in combination with a molybdenum receiver for flag style plates provides a reliable solution for sample annealing. A K-type thermocouple is mounted on the sample receiver. In-vacuum brake for RM40, RMHS40 and GMD40 sample transporters. UHV compatible miniature cable AWG 36. OD=0.3mm, PFA-Jacket. Conductor material: Silver plated copper, stranding = 7x0.05mm, crossectional area 0.014mm2. Price per 1 meter. Discounts may apply for larger quantities. Miniaturized 13-Pin spring probe connector for use in UHV. Spring probe pins provide a reliable electrical contact. Miniaturized high precision spring probe contact. Load lock chamber with removable O-ring sealed quick access door. Transfer flange DN100CF, 3 additional ports DN40CF, 1 port DN16CF. Load lock chamber with O-ring sealed quick access door. Transfer flange DN40CF, 3 additional ports DN40CF, 1 port DN16CF. Load lock chamber with O-ring sealed quick access door and MD16 linear/rotary feedthrough, transfer flange DN40CF, 3 additional ports DN40CF. Transfer flange DN63CF, 3 additional ports DN40CF, 1 port DN16CF. Load lock chamber with O-ring sealed quick access door and MD16 linear/rotary feedthrough with tube support, transfer flange DN63CF, 3 additional ports DN40CF. Load lock chamber with O-ring sealed quick access door,top or side loading version. Transfer flange DN40CF, 2 additional ports DN40CF, 1 port DN16CF, pumping port DN63CF. Load lock chamber, transfer flange DN63CF, material: stainless steel 304L. Quick access door, top or side loading version. Pumping port DN63CF. Oversize tube CF40 (DN40CFWS) for wobblestick manipulator. Quick fastening lock ring for RM and GM sample transporters with 40mm OD. tubes. Battery Operated High Voltage Controller for UHV-Suitcase VSN40S and Ion Pumps. 5 kV positive output voltage. Pressure display and optional temperature measurement for Cryo version of VSN40S. Power controller for the activation of Non Evaporable Getters. Drives NEG-elements of NexTorr™ D-100-5 and D-200-5 pump models. Magnetically driven single shaft linear/rotary feedthrough with mounting flange DN40CF and zero retracted length. Especially suitable in this specification for implementation with NexGeneration UHV Suitcases. Magnetically driven single shaft linear/ rotary feedthrough with mounting flange DN40CF. Magnetically driven dual shaft linear/ rotary feedthrough with mounting flange DN40CF. Magnetically driven dual shaft linear/ rotary feedthrough with mounting flange DN40CF and rotation lock. Please select your prefered tube support necessary for rotation lock. The presented magnetic coupling limits rotational motion and is made for dual shaft sample transporters of the type RMDG40. Miniature Single Axis X-Translator with mounting flange DN16CF. X-travel +/-3mm travel. Free bore diameter 16mm. Micrometer located centrally on main block. Boomerax high precision XY stage with +-12.5mm XY travel and bellows ID=100mm. Standard base flange DN100CF tapped metric M8. Standard top flange DN63CF tapped metric M8. Other flange sizes/types on request. Options include motorization, encoders and constant force compensation springs for vertical loads. Boomerax - returns precisely. Always. Boomerax high precision XY stage with +-25mm XY travel and bellows ID=100mm. Standard base flange DN100CF tapped metric M8. Standard top flange DN63CF tapped metric M8. Other flange sizes/types on request. Options include motorization, encoders and constant force compensation springs for vertical loads. Boomerax - returns precisely. Always. Boomerax high precision XY stage with +-10mm XY travel and bellows ID=38mm. Standard base and top flange DN40CF tapped metric M6. Options include motorization, encoders and constant force compensation springs for vertical loads. Boomerax - returns precisely. Always. Bellows sealed linear translator DN160CF. Free bore 150mm. Z-travel ranges 200, 300, 400, 500 and 600mm. Compact mounting chamber for electrical feedthroughs on XYZ manipulators. CF63 and CF40-Tapped mounting flanges, 5xDN16CF tapped flanges for electrical feedthroughs. The base flange provides threaded ring segments for mounting the manipulators support tube. Extra compact mounting chamber for electrical feedthroughs on XYZ manipulators. CF63 and CF40-Tapped mounting flanges, 5xDN16CF tapped flanges for electrical feedthroughs. The base flange provides threaded ring segments for mounting the manipulators support tube. Compact mounting chamber for electrical feedthroughs on XYZ manipulators. CF63 mounting flanges, 5xDN16CF tapped flanges for electrical feedthroughs. The base flange provides threaded ring segments for mounting the manipulators support tube. Compact mounting chamber for electrical feedthroughs on XYZ manipulators. CF63 tapped mounting flanges, 5xDN16CF tapped flanges for electrical feedthroughs. The base flange provides threaded ring segments for mounting the manipulators support tube. Compact mounting chamber for electrical feedthroughs on XYZ manipulators. CF63-Tapped double-sided flange, 5xDN16CF tapped flanges for electrical feedthroughs. Port aligner DN100CF (6''), L=100 +/-5mm, free bore 104mm. Port aligner DN16CF (1.33" OD), L=51mm +/-6mm, free bore 16mm. Compact port aligner DN160CF (8" OD), L=95 +/-5mm, clear bore 127mm. Gas pressure spring supported Port aligner DN160CF L=210mm with free inner diameter 150mm and +/-35mm lateral deflection. A device for the alignment of UHV equipment. Compact port aligner DN200CF (10" OD), L=100 +/-5mm, free bore 200mm. Ultra compact port aligner DN40CF (2.75" OD), L=53mm +4mm/-11.3mm, free bore 38mm. Hexapod Port aligner DN40CF (2.75" OD), L=90 +/-5mm, free inner diameter 38mm (if centered). Hexapod port aligners are especially sturdy and allow for adjustment of lateral as well as angular displacement. Port aligner DN63CF (4.5" OD), L=100 +/-5mm, free bore 65mm. Compact port aligner DN63CF (4.5" OD), L=75 +/-5mm, free bore 65mm. We provide Swiss precision mechanical parts in accordance with your drawings, 3D models or instructions. Electrically isolated jaws for DC-heating, sample bias or current measurement. Base model for application specific machining of the jaws. Pincer Grip for VG-Stub Style Sample Holders. Customized pincer for Specs Joule-Thompson SPM respectively the Specs TytoTM Precision SPM Head. The Parking Lock MD helps to find the right turn position before the Sample holder reaches the parkting position at a Linear/Rotary Feedthrough. The Parking Lock helps to find the right turn position before the Sample holder reaches the parkting position. This parking lock defines the correct position of the transfer arm when the sample holder reaches the retracted parking position. UHV Preparation system for Elmitec Photoelectron Emission Microscope delivered to Paul Scherrer Institute (SLS) in 2004 and installed to PEEM, Beamline SIM-X11MA. A membrane pump with 60l/min pump capacity. Ideal in combination with the EXSICA3S or the EXSICA2W or as a roughing pump for vacuum systems. Continuous rotation, mounting flange DN16CF. Continuous rotation, mounting flange DN16CF, 1Nm high-torque version. Continuous rotation, mounting flange DN40CF. Magnetically driven continuous rotation, mounting flange DN40CF. Precision scale with 1 deg main scale and 0.1 deg vernier. A multi purpose receiver for SHOM sample plates. The sample is secured by Ruby spheres pressed to the rear of the sample by an integrated leaf spring. This receiver is made for precise and especially reproducible positioning of SHOM3S slotted sample plates. Ruby spheres fixate the position of the sample by a proper three-point contact. Sample receptor for SHOM plates. Fits directly on top of a HTR1001 Boralectric™ resistive heater. Sample storage stack for SHOM flag style sample plates. 3 single spaced and two double spaced slots. Including straight (in-line) adapter for MD, RM40, GMD and WM type single shaft manipulators. Sample storage stack for SHOM flag style sample plates. 3 single-spaced and two double spaced slots. Sample storage stack for SHOM flag style sample plates. 4 single spaced slots. Stack of multiple receptacles for SHOM sample plates. Sample receptors can easily be mounted on top of each other to build a sample storage. Sample storage stack for SHOM flag style sample plates with 3 single spaced, labelled slots. Including orthogonal (perpendicular) adapter for MD, RM40, GMD and WM type single shaft manipulators. Sample storage stack for SHOM flag style sample plates with 5 single spaced slots. Stage consisting of four towers, each tower featuring five double spaced slots for SHOM flag style sample plates. The sample plates are held in place by two beryllium copper leaf springs. Adapter to VG-Scienta's ZEBH E-beam heater for SHOM sample plates. The matching receiver for SHUPSCH sample plates for 1 inch wafers. With a central opening for optical access from the rear side. Configuration example of a 1-axis motorized, magnetically driven single shaft sample transporter DN40CF with slide bearings. Magnetically driven single shaft sample transporter equipped with manual linear drive with handwheel. 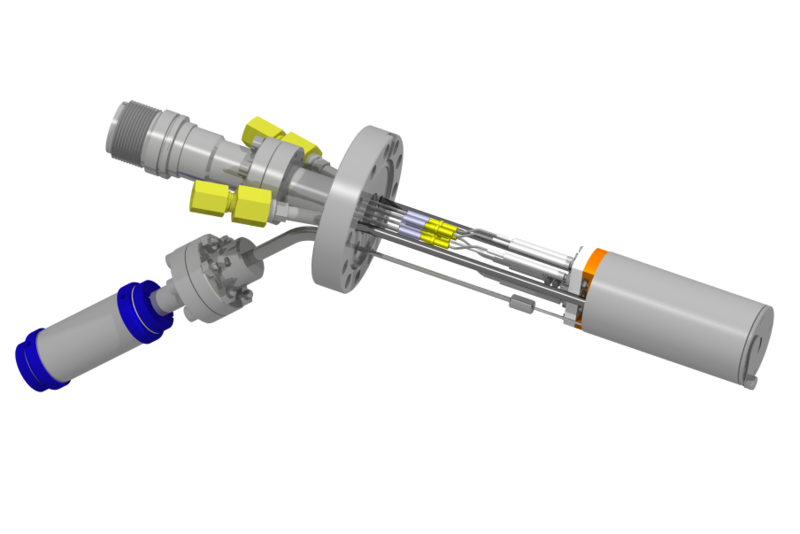 Magnetically driven single shaft sample transporter with manipulation extension that enables the user to stand close to the system regardless of shaft extension/retraction. Precision magnetically driven dual shaft sample transporter with independent rotary motion of the inner shaft. Mounted pincer grips are oriented vertically. The independent rotation of the inner shaft is used to drive the installed waver lift: FRKLIFT. Precision magnetically driven dual shaft sample transporter with independent rotary motion of the inner shaft.Mounted pincer grips are oriented horizontally (H). Precision magnetically driven sample transporter with independent rotary motion of the inner as well as the outer shaft and pincer grip for Omicron-plates. Configuration example of a 2-axis motorized precision drive unit equipped, dual shaft rotatable sample transporter. Provides automatic and reproducible extension and independent rotation of the two shafts. Precision magnetically driven sample transporter with independent rotary motion of the inner as well as the outer shaft with rotation stop option. Precision magnetically driven sample transporter with independent rotary motion of the inner as well as the outer shaft and rotation stop option and pincer grip for flag style sample holders. Precision magnetically driven single shaft linear sample transporter without rotary motion. Magnetically driven, single hollow shaft sample transporter with mounting flange DN40CF and in-vacuum brake. Hollow shaft sample transporter with in-vacuum brake and belt drive. Magnetically driven sample transporter with independent rotary motion of the inner as well as the outer shaft. Slide bearings for linear motion throughout guarantee for long-lifetime and smooth operation even after numerous bakeout cycles. Magnetically driven sample transporter with independent rotary motion of the inner as well as the outer shaft and pincer grip for SHOM flag style sample plates. Slide bearings for linear motion throughout guarantee for long-lifetime and smooth operation even after numerous bakeout cycles. For two block style sample holders 12x5x19.5mm. Fits to KS load locks and all MD and GMD sample transporters. For two SHOM sample plates. Fits to KS load locks and all MD and GMD sample transporters. Especially compact carrier for four SHOM sample plates. Fits to KS load locks and all MD, RM40 and GMD sample transporters. For three SHOM sample plates. Fits to all MD and GMD sample transporters. For 4x block style sample holders 12x5x19.5mm. Fits to all MD and GMD sample transporters. Storage box for Sample Plates. The box is made of Polystyrene(PS). The Storage box is suitable for the EXSICA3S. Replacement kit for bearings of WM40-manipulators with a 7mm shaft. We plan, design and build system solutions for Synchrotron and FEL radiation set-ups and experiments. Presented are a few examples of implemented projects. For tailor made solutions please contact us. Block style holder with four M1.6 screws for sample mounting. Commonly used flag style sample holder with 4x M1.4 screws and leaf springs for clamping the sample. Example of a flag style sample holder for type K102 single crystals. For other single crystal types, please contact us. Requires RECOMDCRA sample receiver with two high current electrical contacts. Commonly used flag style sample holder with 5x M1.4 screwsholes. Flag style sample holder for rectangular single crystals. Like K102. To hold other single crystal types, please contact us. Flag style sample plate for wafers with 1 inch diameter. With central opening for optical access from the rear side. Sampleholder for VG Microlab and older VG ESCA-labs. HT31 PD Temperature controller with electronic power regulation. Nominal output power can be adjusted between 100 % to 0 according to individual power requirements. The set-point of the temperature regulator can be digitally adjusted into increments of 1 °C. Combination spanner size 10mm for M6 hexagonal head screws and hex nuts. Fits to metric bolt sets for DN40CF (2.75") flanges. Combination spanner size 13mm for M8 hexagonal head screws and hex nuts. Fits to metric bolt sets for flange sizes from DN63CF (4.5") up to DN250CF (12"). Two 10mm OD bars, support and protect the sample transporter. Belt drive with one hand wheel for linear and a small (precise) hand wheel for rotary motion. For easy handling of vertically mounted sample transporters RM40, RMD40 and GMD40. Two 16mm OD shafts support and protect the sample transporter. Manipulation extension for sample transporters. Enables the user to stand close to the system regardless of shaft extension/retraction. Tube Support for Sample Transporters mounted to NexGeneration UHV Suitcase for vertical usage VSN40S(V). A useful accessory to align and keep the deflection angle of a wobblestick manipulator. Three thumbscrews are used to position the wobblestick axis. Maximum deflection angle = +-8 degrees. Deflection Limiter to restrict the angular deflection of wobblesticks to three degrees. External support rail for wobblestick manipulators. Protects and supports wobblesticks while they are not in use - also in non-horizontal usage. Lock ring for locking the external support rails TSWM with three or four knurled screws. External support and parking rail for vertically mounted wobblestick manipulators. Protects and supports wobblesticks while they are not in use. Upgrade from 150°C to 200°C bakeout temperature for GMD single and RMD dual shaft (single rotary) sample transporters. Upgrade from 150°C to 200°C bakeout temperature for RMJG dual shaft rotary sample transporters with independant rotary motion of the inner as well as the outer shaft. Upgrade from 150°C to 200°C Bakeout Temperature for Single Shaft Wobblesticks and L/R Feedthroughs High Torque Version. Upgrade from 150°C to 200°C Bakeout Temperature for Dual Shaft Wobblesticks and Dual L/R Feedthroughs. Absolute, optical linear encoder. Stainless steel scale. Welded Viewport for view inside the chamber from the rear side. Two additional DN16CFT service ports for vacuum gauge, electrical feedthrough, etc. Additional DN40CFT service port for vacuum gauge, electrical feedthrough, etc. Ultra compact DN40CF cross used as buffer volume between a UHV-system and a vacuum suitcase. Insert length 80mm, with a port for pumpdown using a turbo pump and an additional CF40 for an vacuum gauge. Fast pumpdown dock for UHV Suitcase. A turbo pumped, compact docking chamber is equipped with a dewar version LN2 cold trap with heating coil and temperature sensor. Fast pumpdown dock for UHV Suitcase. A turbo pumped, compact docking chamber is equipped with a flow through version LN2 cold trap with heating coil and temperature sensor. The Mini NexGeneration UHV Suitcase is the smallest standard version of our ultra compact, lightweight and modularly adaptable system to keep and carry your samples under true ultra-high vacuum conditions. It is delivered under vacuum, fully baked and ready to use. The VSN40M(CF16) is available in a variety of configurations with diverse options and upgrades. Please download our questionnaire and get in touch with us to discuss your preferred combination. This common configuration of the Mini NexGeneration UHV features an MD16(TS) linear/rotary feedthrough DN16CF with TSMDH tube support and an RSCPS6OM revolving sample carrier for two SHOM sample plates. Professional transport case for NexGeneration UHV Suitcase. This common configuration of the NexGeneration UHV Suitcase features an RMD40(H) dual shaft sample transporter, an RSCRMD2OM revolving sample carrier for SHOM sample plates and a TSRMVSNH tube support. This common configuration of the NexGeneration UHV features a WMG40 dual shaft wobblestick with FC fine adjuster and a PGWMS(OM) pincer grip for SHOM sample plates for sample transfer. The additional MD40(Y0) single shaft linear/rotary feedthrough holds a RECOMSTACK(S3D2) stack of three single and two double-height sample receivers and the included Rear View welded viewport offers a very useful additional viewpoint from the rear side of the chamber. This example of a cryo version of a NexGeneration UHV suitcase is intended for the transport of sensitive cryo cooled samples without interrupting the cold chain or breaking the vacuum. Bake out tent for NexGeneration UHV suitcase, including heater module. High power magnetically driven single shaft wobblestick with mounting flange DN40CF. Magnetically driven dual shaft wobblestick manipulator with mounting flange DN40CF. Magnetically driven dual shaft wobblestick with mounting flange DN40CF. Linear travel: 100mm, continuous rotation. Typical lead time: 1-2 weeks. REV 25.08.2014 JK. Magnetically driven dual shaft wobblestick with mounting flange DN40CF. Linear travel: 150mm, continuous rotation. Typical lead time: 1-2 weeks. REV 25.08.2014 JK. Magnetically driven dual shaft wobblestick with mounting flange DN40CF. Linear travel: 200mm, continuous rotation. Typical lead time: 1-2 weeks. REV 25.08.2014 JK. Magnetically driven dual shaft wobblestick with mounting flange DN40CF. Linear travel: 250mm, continuous rotation. Typical lead time: 1-2 weeks. REV 25.08.2014 JK. Magnetically driven dual shaft wobblestick with mounting flange DN40CF. Linear travel: 300mm, continuous rotation. Typical lead time: 1-2 weeks. REV 25.08.2014 JK. Magnetically driven dual shaft wobblestick manipulator with ADOMO adapter. Magnetically driven dual shaft wobblestick manipulator with ADOMO2 adapter. Magnetically driven dual shaft wobblestick manipulator with ADOMS adapter. Magnetically driven dual shaft wobblestick manipulator with orthogonal pincer PGWMO(OM) for SHOM flag style plates. Example with straight pincer PGWMS(OM) for SHOM flag style sample plates and TSWM parking rail. Magnetically driven dual shaft wobblestick manipulator with fine adjuster magnetic coupling. Magnetically driven dual shaft wobblestick manipulator with straight, parallel opening pincer PGWMP for SHOM flag style plates. Magnetically driven dual shaft wobblestick manipulator with customized pincer for Specs Joule-Thompson SPM, more specifically the Specs TytoTM Precision SPM Head. For rotary motion between the two invacuum shafts. WMGWA40 models feature an extra wide angular range of +/-28°. Magnetically driven dual shaft wobblestick manipulator, wide angle, with orthogonal pincer PGWMO(OM) for SHOM flag style sample plates. Magnetically driven dual shaft wide angle wobblestick manipulator with straight pincer grip PGWMS(OM) for SHOM flag style sample plates. Zero Length Reducing Flange CF100/CF40 with bevelled inner edges. Customized for use with wobblesticks. Zero Length Reducing Flange CF63/CF40 with bevelled inner edges. Customized for use with wobblesticks.